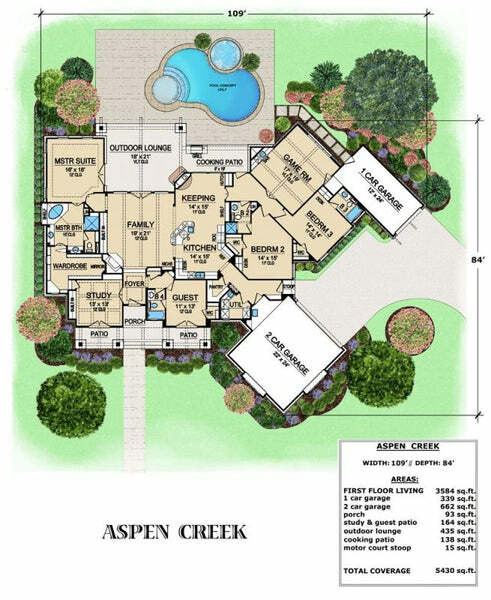 Archival Designs' highlighted luxury house plan for the month of April is Aspen Creek. Whether the grandparents are coming for avisit or college students coming home to roost for awhile, this one story 3584 square foot luxury plan will fill all your needs and dreams! I like to call these homes, tri-homes, as they can be occupied by three generations. From 2005 to 2009, family households added about 3.8 million extended family members, from adult siblings and in-laws to cousins and nephews. Extended family members now make up 8.2% of family households, up from 6.9% in 2005, according to Census data out this week. The economic downtown over the last several years has caused families to move in together. There are also signs of a shift from family households. For the first time in more than a century, more than half of people aged 25 to 34 have never been married. 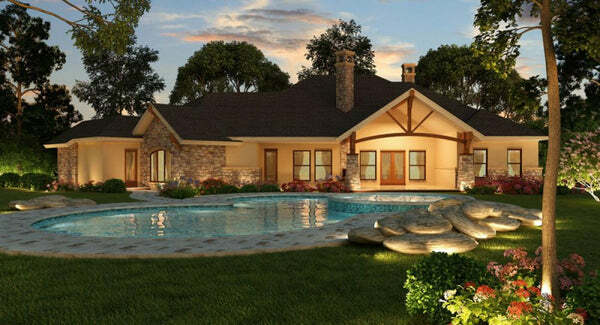 So having said all that, let's take a look at Archival Designs' Luxury House Plan, Aspen Creek. As you enter the luxurious foyer, you'll notice it is flanked by a cozy study with coffered ceiling and built-ins; and a guest bedroom, complete with a full bath and walk-in closet. This first floor guest bedroom is a wonderful choice for elderly parents, with no steps to go up and down, offering a well-lit area for reading, relaxing and enjoying the view through the doors to the private patio. The quiet study can be entered through the master suite or the foyer, while double doors lead to a private front patio. Centrally located in the main living area are the family room, kitchen, and keeping room, separated only by the breakfast bar in the gourmet kitchen. While the pantry and desk are built into the kitchen, you'll love the corner fireplace, hutch and shelves built into the keeping room. Outside the keeping room, enjoy barbequing on the cooking patio. The 12 foot ceiling in the family room affords a feeling of openness, while the windows in the family room, offer well lit rooms with scenic views onto the outdoor lounge, cooking area and (concept) pool. To the right of the central living area are two family bedrooms, each with walk-in closets and full baths. One of the bedrooms is in close proximity to the one-car garage, with access to the vaulted-ceiling game room. This would be great for that college student or older teen. Access to the garage can also be obtained via the lanai from the pool area. On the left side of this floor plan is the elegant master suite, boasting a luxurious bath with his and hers vanities, separate shower, corner garden tub and huge wardrobe area with built-ins. Private entrances from the master suite lead to the study and the outdoor lounge. A utility room completes this luxury floor plan. Choose from more than 400 house plan designs that we offer in a wide range of styles and sizes. Some of our more popular house designs include European-inspired Georgian and palladian homes, English manor house plans, Tuscan-style Italian villas, French chateaux, and colonial house plans. Our Tuscan-style villas range from 1800 sf to 14,814 sf. Our Newport classsic house designs range from 1500 to 5000 sf. Our starter castles, mansions and estate homes are designed in the grand tradition of some of the most impressive homes in the world. Please feel free to search our house designs offered. Our plans have been built around the globe, from Canada to Dubai, and one could be just for you!